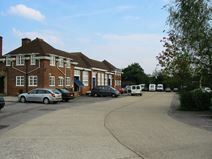 Office Space - London Colney, Hertfordshire. A vast 1930s built property which was formerly a school and now presents a range of office units/workshops of varying sizes constructed around a sizeable car park. Ideal for a range of businesses, the premises are close to motorway junctions and retail and transport hubs. There are fantastic transport links, with frequent and fast Thameslink services running into Central London, as well as airports nearby.